If you’re not assessing, you’re simply guessing! 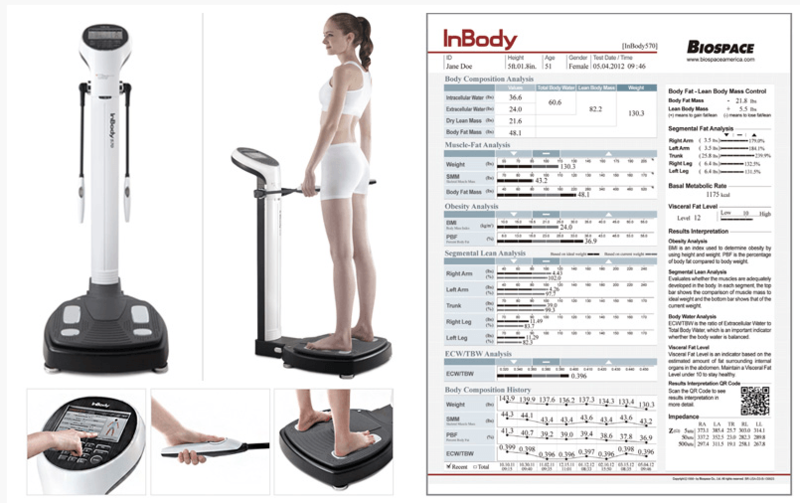 The InBody compliments us as Health Professionals to regularly monitor your level of body fat and in particular your skeletal muscle mass so you can understand how your diet, lifestyle, and training regime are influencing your overall body composition and accelerating your results. The InBody measures and analyses your body composition in terms of water, fat, protein, muscle, bone mineral and much more. The device can determine the weight of lean muscle tissue in each limb, the amount and percentage of body fat, bone mineral content, as well as a host of other valuable information. Judge quality fat loss over muscle weight loss. Your ultimate goal is to increase muscle mass and decrease body fat %. The statistics can’t lie, these results will provide you with exactly what is happening underneath, inside your body. This is a complete calculated and accurate way of understanding your overall health from the inside rather than looking from the outside trying to guess and judge if your new training program is working for you or not.